As part of the CECILIA2050 project, three modelling approaches were employed to determine the pathways and implications of the ambitious emission reductions in the European Union, with two of the approaches linking developments in the EU with the rest of the world. This report draws together the key results from each of these broadly co-ordinated modelling exercises, compares and discusses key similarities and differences and draws out implications for the development of a low-­carbon economy in the EU up until the year 2050. Section 2 provides a description of the three modelling approaches, whilst Section 3 details the scenarios produced for assessment under each approach. Section 4 then compares the approaches and scenarios, to highlight key similarities and differences. Section 5 presents the key results of the key scenario, beginning with high-­level results surrounding CO2 emissions, energy consumption, carbon prices and economic impacts, before describing and comparing sector-­level results and implications. Section 6 concludes. Drummond, Paul. 2014. 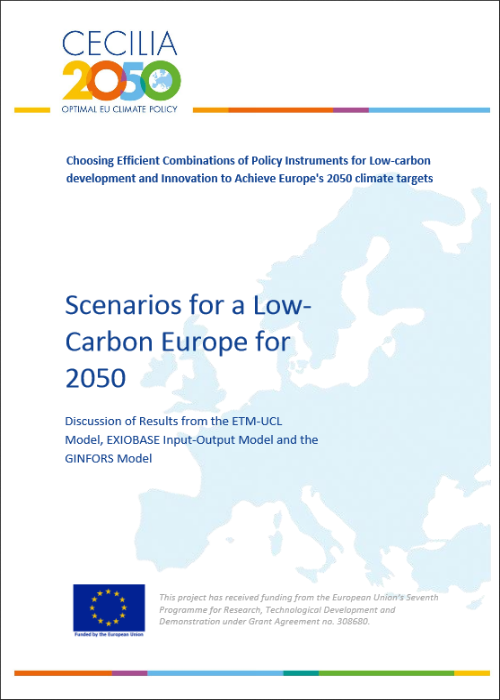 Scenarios for a Low-­Carbon Europe for 2050: Discussion of Results from the ETM-­UCL Model, EXIOBASE Input-­Output Model and the GINFORS Model. CECILIA2050 WP3 Deliverable 3.4. London: University College London.